We came from villages to the city and left our roots behind. Spreading smiles from Urban Leaves to farthest ends of the globe. During the course of these 9 years at developing the terrace garden at MbPT, I came across so many like minded people and shared a deep bond with them. With all the talk of global warming, food insecurity,the threat of GM crops,farmer suicides, garbage problems in the city, pollution,vanishing of green spaces, rising stress levels we felt it was time to "walk the talk".Urban Leaves was born under the aegis of "Vidya Varidhi Trust" in my drawing room one such evening when I sat down with a few of my close friends. 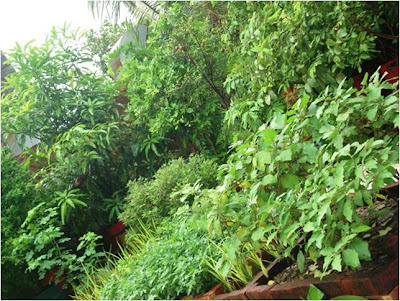 We didn't really have much to start with except a sincere wish to see as many green terraces in Mumbai as possible, a committed heart, and wonderful friendships always inspiring and supportive of our endeavors and our failures. Come! Won't you join us! A small initiative, will go a long way in saving mother earth!